“When I came to the club it had a smell of death around it. You were not sure whether it would survive,” says Tranmere Rovers chairman Mark Palios. It is April 2014 and Palios, a one-time Tranmere midfielder and ex-Football Association chief executive, is back at Prenton Park to catch up with old friends and take in a League One game. He finds his former club deep in the mire, a stench of relegation hanging in the air having just sacked manager Ronnie Moore after he admitted breaking FA betting rules. Meanwhile, Tranmere’s accounts were showing debts of around £1.8m. A few days later Palios is driving through France with his lawyer wife, Nicola, when confirmation of the Merseyside club’s demise comes through on the car radio – a 2-1 home defeat by Bradford City and results elsewhere sending Tranmere into League Two. Palios, 66, and his wife, who is vice-chairman, are now in their fifth season at the helm since taking a controlling interest from outgoing chairman Peter Johnson. It has been far from easy, turning round the fortunes of a club that reached the League Cup final in 2000. 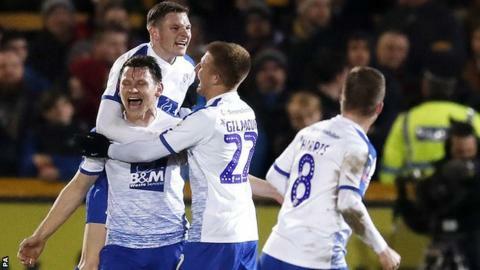 Twelve months after falling out of League One, Tranmere were relegated from the Football League for the first time and, as recently as September 2017, were 18th in the National League. Three seasons in non-league resulted in losses of around £3.5m, yet things are finally looking up for the Birkenhead club. Having earned promotion back to League Two in May – despite playing 89 minutes of last season’s National League play-off final with 10 men against Boreham Wood – Tranmere start 2019 pushing for a place in the third tier. On Friday, Micky Mellon’s side host Tottenham in an FA Cup third-round glamour tie – reviving memories of when Tranmere reached the quarter-finals of the competition three times between 2000 and 2004. Born in Birkenhead, Palios joined Tranmere after leaving school, having spent part of his childhood in care when his father (who later died when Palios was 16) was admitted to hospital. “Tranmere was a massive part of my life. All the other players were full-time and I played in the Football League as a part-time professional,” he said. “They allowed me to go to university and they allowed me to be a chartered accountant. Prenton Park is just a few miles from Everton and Liverpool, and attracting new fans – in an area of high unemployment and poverty – is an ongoing battle. Last month, the chief executive of Wirral’s YMCA hostel for homeless people expressed concerns over the ‘phenomenal’ rise in numbers using its services. The club works closely with both the Tranmere Rovers Trust and Tranmere Rovers Official Supporters Club to reach out to those in need while providing income for the club. Fans and club staff donate money for tickets so disadvantaged children can watch the team play. It has proved such a success that more than 10,000 tickets were distributed around the community in 2016-17. Two of those to benefit from the scheme is a victim of domestic abuse and her 12-year-old son. Through the club, fans have also donated food and, over Christmas, toys to local people struggling financially. Meanwhile, the old directors’ car park at the ground is now a fan park run by the trust on match days – an indication of the solid relationship between the club and its supporters. “The money they make comes back into the club,” added Palios. “The fans have been a massive part in moving this club forward. The Palios are very much ‘hands-on’ owners. They live in a house fewer than three miles from the ground and two of their daughters – Sofie and Emma – have roles at Tranmere. A third, Chloe, is also working at Prenton Park while she waits to start a job in London. All three have first-class degrees. Nicola, 51, is an experienced businesswoman and Palios says: “Nicky and the girls are a good executive team for what we need to get done. Palios, who resigned from his position with the FA in 2004 following stories abut his private life, is reluctant to disclose how much money he and his wife have ploughed into Tranmere. However, while his business plan is sustainable for League Two and League One, Palios admits substantial new investment will be needed if the club is to return to the Championship for the first time since 2001. “There’s almost an inability to compete on a level playing field now in the Championship if you are coming out of League One,” he adds. “Before we came here the turnover – excluding handouts from the league – was between £1m and £1.5m. Now it’s possibly £5m-£7m. So what impact will the money from the tie have on the League Two club? “Spurs is a big game, not so much from the financial perspective although that will help,” said Palios.